I feel like I’ve reached “the big league” by being able to review books for my blog. 😉 I’m looking forward to sharing a couple more books I’ve got lined up and it gives me a chance to read some new things. 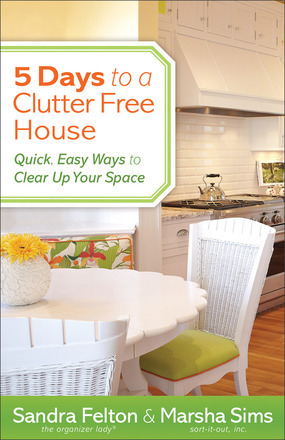 It’s interesting that the first book I got was 5 Days to a Clutter-Free House. It’s definitely an area I always struggle with. I have some good habits around the house and recognize the need for some better habits, so I was curious how this would motivate me. The first section of the book, the “5 days” part, really didn’t apply to me. It focuses on cleaning a home that is one step away from being on the show Hoarders. It brings a team approach to cleaning your house so that you can actually see quick results. Perfect if you aren’t a mom with two young kids and all your friends also have young kids. The authors, Sandra Felton & Marsha Sims, did provide tips for if you need to practice this approach on your own and I was able to gain some new tips for getting some deep cleaning under control. My favorite was first focus on items in the area of feet to your knees, the next day focus on your knees to your shoulders, followed by your shoulders to the ceiling and then finish with the cabinets. I think I could use that as a good rule of thumb whenever I get into a spring cleaning mode. As much as I felt the first section didn’t apply, I loved the second section. The second section focused maintaining your home after you get the major clutter cleared out. The author is the founder of Messies Anonymous so she understands people who, by nature, are not organized people. Instead of feeling bad that I can’t figure out this whole homemaking thing and just have a clutter-free house, I was able understand some ways to embrace my personality and come up with some solutions. I don’t think it was anything particularly new, but it was told in a way that makes me want to try a little harder to maintain clean spaces in my house. For that reason alone I would say this book is worth the purchase. Available February 2013 at your favorite bookseller from Revell, a division of Baker Publishing Group. ** Disclosure: I received a free copy of this book in exchange for an honest review here. The opinions expressed above are my own.